Wonderful newly renovated ALL GIRL house in Hawthorne has a Twin room with one vacancy available now. $135 per week ... inclusive of All Bills, Internet, and weekly cleaner. Looking for 1 girl who would like to share a room with a lovely from Columbia. Her room mate just went back to Spain, so hopefully we can find someone who is not a Spanish speaker to share with her. A beautiful large room with an extra study room attached, designed so that one can sleep if the other is up late studying. (2 study desks in the study room). The house has everything supplied. A well equipped modern kitchen with massive smeg gas stove/oven, dishwasher, 2 large fridges and all appliances you need. (All ne and modern). Front and back deck areas to chill and relax. We also supply a weekly cleaner who takes care of all the common areas and bathrooms...YAY!!. Unlimited Internet. Zone 2 with Bus, train and Citycat transport closeby. Close to Bulimba's restaurant strip and Cinemas. Catch the cross river ferry to funky Newfarm with it's weekend fresh fruit and vege markets. Gym across the road, and close to City bike path if you want to ride to the city. All bills are included. Join our happy International household!! Inspections welcome!! Modern 2 bedroom 1 bathroom 2 balcony apartment for rent until August 26th or longer should you choose to stay. Plenty of storage and lots of greenery outside. Easy to clean and tidy happy home. Friendly neighbours and garage parking your own plus visitors. Unfurnished. Beautifully renovated upstairs home with plenty of light and breeze. 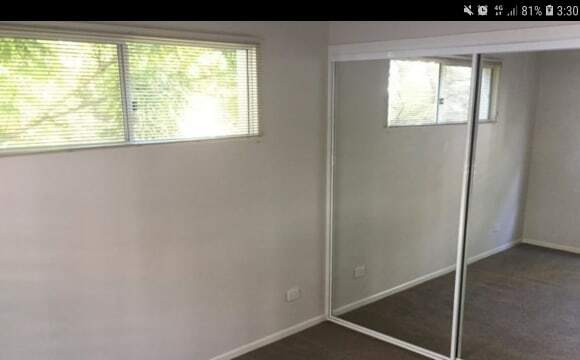 Polished floors, air-con in the lounge room. Great suburb and really close to transport and the city by bus too. Heaps of food places and cinemas down the road in Hawthorne and Bulimba too. 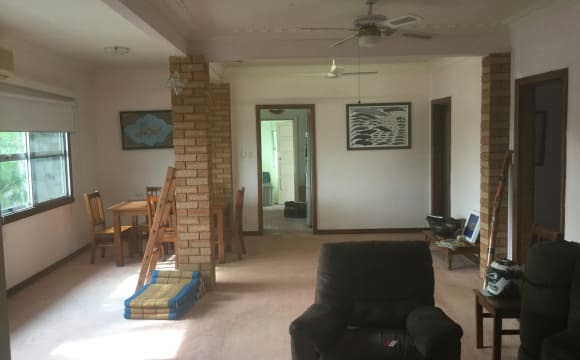 This home is super easy to live in, Feels great, modern and Low maintenance, Has large open plan layout with a huge front deck and bbq area, big kitchen that is good if you like to cook, Fully furnished, super fast internet and broad band. You are going to be able to study, relax and recharge here. Its very close to the river, you can city cat easily get to city valley. Its a fun house and I am busy with my work so I dont sweat the small stuff Looking for clean person who is social rent includes all bills. We are less then a 5min walk to all amenities, including ferry, bus stops, restaurants and movies. 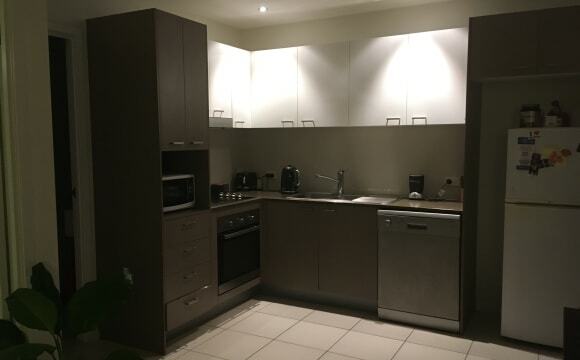 Located close to Brisbane river and parks. The property is 3 bedrooms and bathrooms upstairs and all living downstairs with an outdoor area. Fans in bedroom and 2 air conditioners. This apartment is convenient to super markets, gyms, train station and the fancy oxford street bars and restaurants of Bulimba, the house is fully furnished with all necessities and you only need to bring furniture for your spacious room, there is a very large deck to entertain your guest with a projector in the lounge giving you a movie effect experience when watching movies :) The $200 rent covers all bills including power, internet, water and rent. 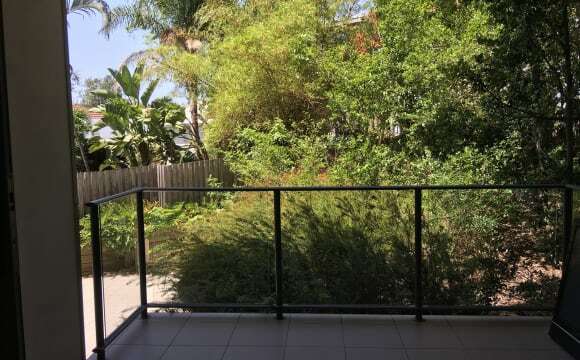 Super relaxed and clean home in an aircon room with built in wardrobes very close to the Hawthorne City Cat. The house is a 5 min walk to, Hawthorne Garage, 5 min walk to city cat, the cinemas or Oxford st. Its on a very quiet street away from the hussle and bustle of Oxford st but close enough to be there in a few minutes. Its a very large block which is enclosed so heaps of room. House on a big block has 3 bedrooms and 2 bathrooms. The house is fully furnished - We have unlimited internet. 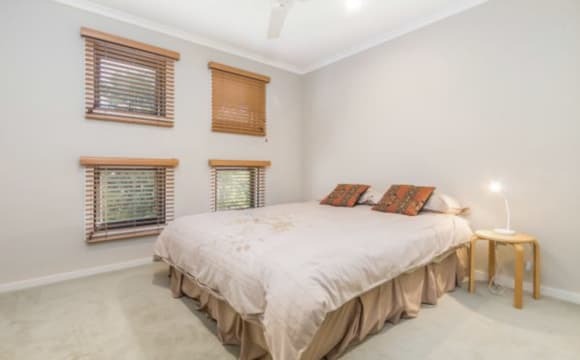 The bedroom has built wardrobes and windows opening onto the huge back yard. The house is on a very quiet street in Hawthorne a stones throw from the river. You’ll love this house. 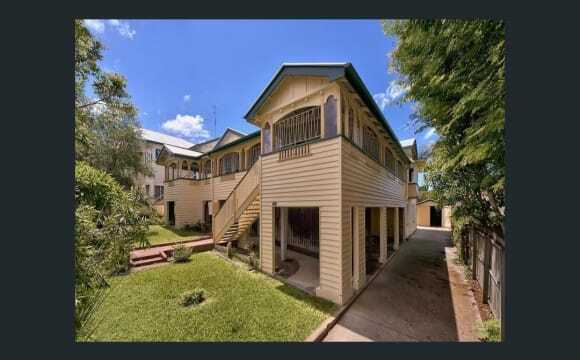 Traditional Queenslander close to trendyOxford Street with modern amenities. Transport at your door. Move into a place you can call home! 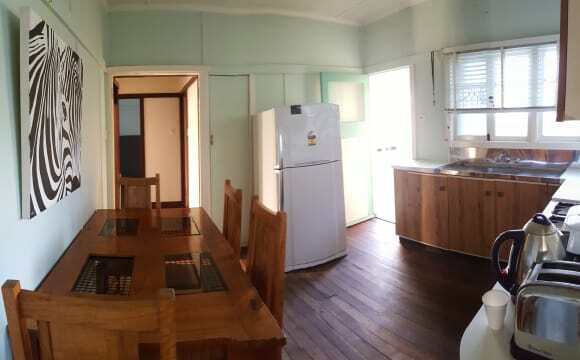 Close to trendy Oxford Street and transport outside door, this Queenslander cottage with polished floors is an ideal place to live for a professional person. Just 4kms from the CBD, transport is outside the door. With modern amenities, polished floors and is ready to move into you will share with one other female. The house has good security. An outside courtyard and BBQ. Share electricity and gas. Telephone Lara. Looking to fill urgently! You will also have your own private TV room. 2 ROOMS AVAILABLE - 1x private room (Private balcony) with shared bathroom - 1x Master with en-suite (Private balcony) with walk in wardrobe This home is a beautifully furnished, spacious, house located right in the heart of Hawthorne, minutes walk from the restaurant and dining district, the Hawthorne Garage, cinemas and the ferry terminal. This property features air conditioning, ceiling fans in all bedrooms and living areas, polished timber floorboards throughout and plantation shutters in all rooms. Out the front, there is an alfresco outdoor setting overlooking a timber deck courtyard with a tropical Green wall garden. It’s clean, easy and cosy. Friendly neighbors and very protected so you can feel safe! Large house with 2 separate living areas. Kitchen is the only shared space. 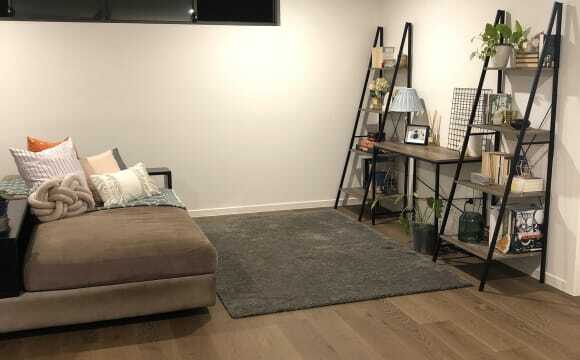 Your living space shared with a 22yo female, secure and private with own front entrance, lounge, dining, bedroom and study. Mostly unfurnished but furnishings include fridge, couch, recliner, bed base, wardrobes. I am a 36yo male. My time is spent between work in the cbd or home office, plus sport 2 times per week, along with socialising with friends usually for dinner or breakfasts. I enjoy my home time to be quiet time mostly. SINGLE:$220 COUPLE:$280 We live in a traditional Queenslander home which is close to the city and 500 metres from Hawthorne Citycat terminal. 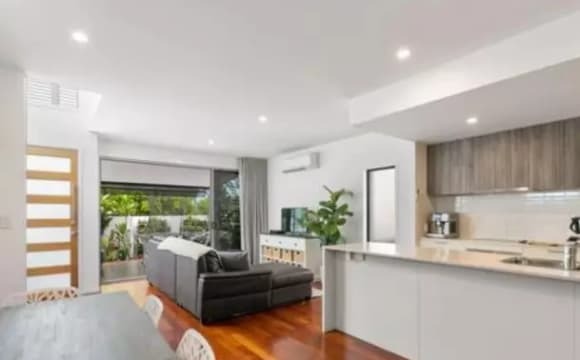 The area is very safe and within walking distance of Bulimba. 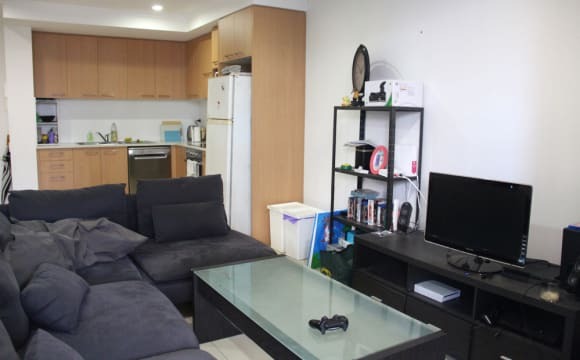 Room available in a spacious three bed, two bath apartment near New Farm park with an awesome view of city skyline. Because the apartment is on the top floor, we have a private rooftop area, which equals the same floor space as the entire apartment. The rooftop is great for taking advantage of the nice weather and simply relaxing. The building is Boulevarde Apartments on Sydney street. Your room is medium size with a build-in wardrobe and ceiling fan and can fit a queen bed comfortably. You'll be sharing the bathroom with one other person. The living room is fully furnished,open and very inviting, and comes with a large covered balcony with views over the quiet tree-lined street. Features/ amenities include; Pool and BBQ entertaining area in the complex. Rooftop and large balcony, secure car park, aircon in living area and wifi. The rent is $240 per week plus an even split of the bills quarterly. Please call or text John to set up an inspection. Fantastic location near the Powerhouse, room comes with air conditioning and an ensuite. Apartment block has a pool and plenty of on street parking. Modern apartment in a great area walking distance to Oxford Street with fabulous house mate (if I don’t say so myself). Complex has a pool, gym and bbq area. Welcome to your new home in New Farm! 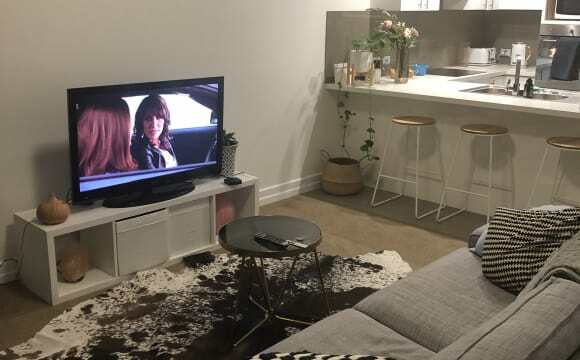 ABOUT THE LOCATION: Come join me (Alex 32) in this beautiful apartment in a secure complex in New Farm – close to New Farm Park, 5 minute walk to the Power House, 15 minute walk to Sydney Street Ferry Stop, 5 min walk to Coles and a short distance to the best bars, restaurants, cafes and activities in the inner city. If being social and getting outdoors, or even just relaxing by the pool or on the sun-soaked balcony with views of the city is your thing, this is the place for you! ABOUT THE ROOM: There is one large unfurnished bedroom and ensuite available for the right person. It easily fits a queen sized bed, 2 bedside tables and a chest of draws without compromising on space, and has an ensuite bathroom and two double wardrobes. The second bathroom also serves as the guest bathroom (dual access from living and bedroom) and includes an internal laundry which can be closed off (does not compromise on bathroom size). ABOUT THE APARTMENT: The apartment is at the rear of the building so there is no street noise (it’s a very quiet complex and neighbourhood anyway), faces a lovely garden below and catches the afternoon sun. There is a large living space and dining area, a study desk with storage, a lovely kitchen with modern appliances and a big balcony. There is air-conditioning/heating but also nice breezes from the balcony. The apartment will be available from mid of October and is furnished. 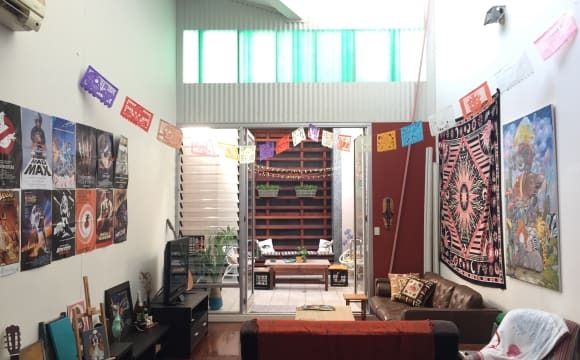 ABOUT THE COMPLEX: Sydney on Sydney is a 2 year old complex in the heart of all the action – accessible via James Street and Brunswick Street, and is a quiet building with a high owner-occupier tenancy. This means it is NOT a party place! The neighbours are lovely, and many have small dogs as many apartments in the complex are pet friendly. It is secure and well monitored, has an on-site property manager, and a communal pool in the centre of the complex. There is secure parking below with plenty of secure, caged storage for your stuff, and there are plenty of undercover car parks for your guests. This apartment is non-smoking!!! This is a three bedroom townhouse and only one room is occupied at the moment which is my room. There are three toilets and two bathrooms. One bathroom is an ensuite which is in my room. There is another bathroom which you will be sharing with another flatmate which has a seperate shower, seperate bath (long bath and very relaxing). There is a toilet located next to the second bedroom in the house and both rooms have a lot of wardrobe space and built in drawers. This house gets plenty of sun and has modern full length blinds. The house has ducted air conditioning in every room. It is pet friendly the house was freshly painted and these photos were taken before furniture had been moved. Flexible with furnishings however most furniture is already in the house at the moment apart from outdoor setting etc. 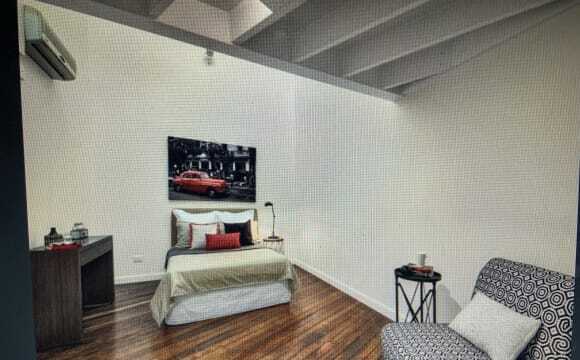 The rooms are extremely big for most townhouses and the unit has been recently painted so the place is extremely modern. 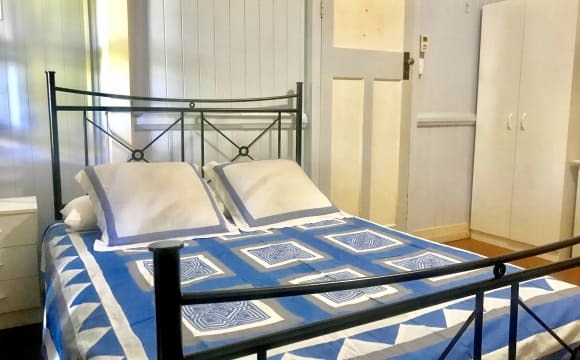 TWIN ROOM AVAILABLE (2 single beds in a private room) : ARE YOU ON A WORKING HOLIDAY WITH YOUR FRIEND AND LOOKING FOR A BASE FOR A COUPLE OF MONTHS? 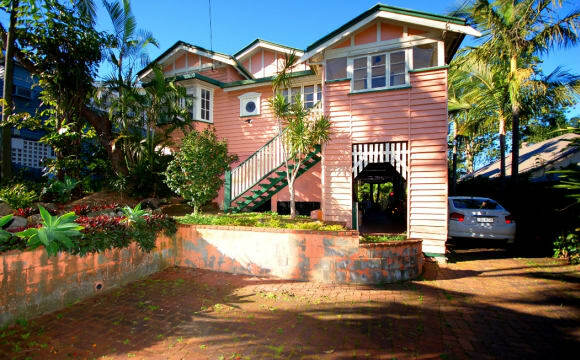 Beautiful old Queenslander - Guest House that offers traditional homely feel. 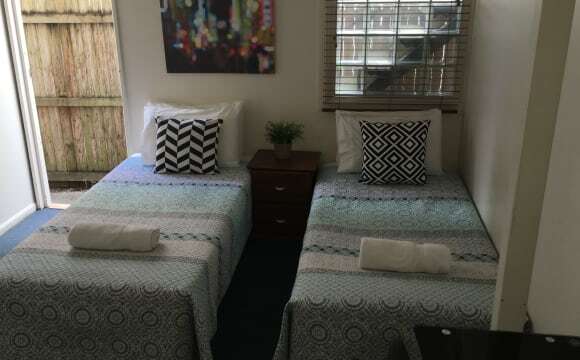 Perfect for a traveler or working professional who is looking for a homely feel, whilst respects peoples privacy and genuinely considerate of common areas, cleaning up after oneself. 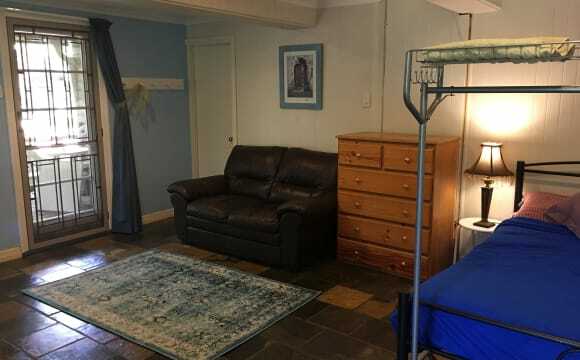 We are offering a room in a lovely Guest House in New Farm. This is not a party house but has very friendly travellers and working Australians. This is the perfect place for someone looking for a clean and quiet home, where you can choose to socialise with people whilst also enjoying your own company and space. Whilst the house contains a communal kitchen, laundry and bathrooms, your own room has a kitchenette including your own fridge and microwave. Linen is not included as we like you to add your own personal touch to make you feel at home. 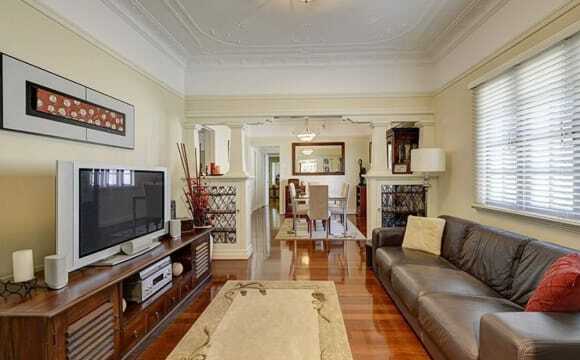 ***Immaculate Townhouse in the Heart of New Farm! *** Overview: For the past 6 months, myself and two other friends have been living here. Due to a promotion at my job, I will now need to move down to the gold coast and therefore switch my lease over to someone new! About the house/available room: - 3 bedrooms - 2 occupied - available bedroom has a built in wardrobe and access to a beautiful little courtyard - built in ceiling fans - this room will be unfurnished - kitchen upstairs - 2 bathrooms &amp; toilets (1 on each floor) - Prime location within 5 min walking distance to new farm park, Coles supermarket, bus transportation (30 second walk), fortitude valley and James street. - Air-conditioned (excluding downstairs rooms - however they are still nice and cool in summer from the fans) - Plenty of FREE street parking - Safe neighbourhood amongst the wealthy Culture: - Warm, friendly and social Bills: - Split 3 ways (internet and electricity) Housemates: Dominic (26) (M) - Young professional working full-time in the city, very neat and tidy (amenities are always clean), keeps to himself responsibly yet a great socialite and easy to talk to. He will be living down stairs with you in one of the bedrooms. Rachel (26) (F) - Young professional working full-time, neat and tidy, spends time away with family and friends over the weekend. She will be living in the bedroom upstairs. Great friend of mine and easy to get along with. Let me know if you have any questions or would simply like to organise a time to take a look! My home is in a tree lined street in a safe and sort after area of New Farm..5 - 10 min walk to the village shops. coffee shops ,restaurants Beautiful New Farm Park, Powerhouse.3 bus stops within a 5 min walk ... 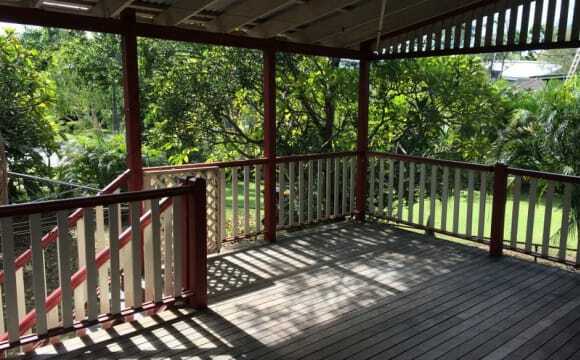 Ferry 10 min walk.It is a well loved large high set Queenslander nicely furnished on a big block of land . Nice garden at the front with a lge back yard.lawn trees.and schrubs ..seats to sit and enjoy.The house has a nice energy. Hey potential housemates, Our housemate is moving. We'll miss him. 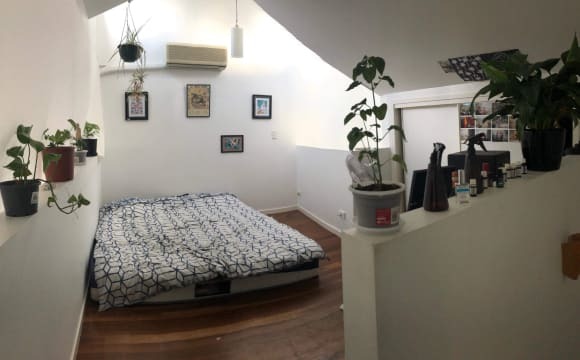 Now we have a room available in our friendly Queenslander right next to Merthyr village (lots of shops) and 5 minutes walk from New Farm Park (best park in the city where we spend a lot of time). We're located on a quiet street but right next to all the coffee shops and restaurants. 20+ places within a 5 min walk. Plus coles is less than 50meters away. About a 15 min walk along the river to the city. The house has all the usual amenities. Big TV with Netflix and comfy couches. We have a large dining room where we someone host big dinners. The house has a huge verandah, and your room has two french style doors that open to allow a lot of light a breeze through (see photos). We also have a cleaner that comes fortnightly. The not so usual is the downstairs space where we a projector, sofas ping pong table, BBQ, bar and refrigerator, and pool table. It's a great place to chill when you've got some downtime. Our housemate moves out around the end of April but this is flexible. The room is unfurnished but we have plenty of storage space and the room also had a side room that comes with it. We also have a awesome dog called Daphne who's a really chilled dog and no bother at all. Please get in contact, we'd be happy to show you the property. Either rent 2 bedrooms and own bathroom for $260, or single room for $135 and share bathroom with one other. 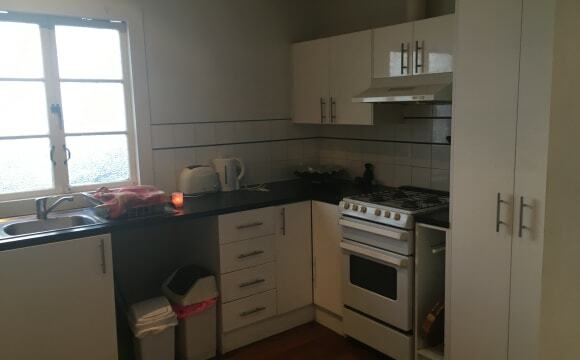 House is close to public transport and city ferry. Short drive to the city. Really good location. Heaps of cafe's etc... in the area. The house is right across the road from bowls club and giant parkland area. To live with a cool dog and owner and a relaxed vibe. Happy to consider other pets :) Share electricity, unlimited internet included in rent. 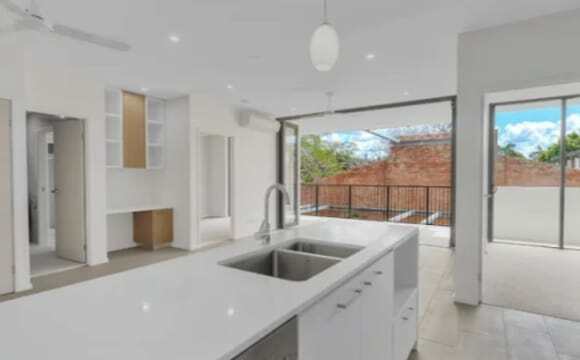 Close to public transport, parks and bowls club. The house is a 3 bedroom, 1 bathroom with an open lounge room/kitchen. Lounge room has air conditioning and there are two living areas with an under the house garage for storage or additional living room. House is furnished at the moment, would just need to bring stuff for the room you'd be staying in.